The DIV4S is still a young group. Their history started in 2008 when Andrea Bocelli wanted to gather people with ‘Eccellenze Nascoste’ (excellent, hidden talents) in different genres. With the DIV4S he wanted to sing in a different way, with an ensemble in another shape than before. Therefore they had to modify popular Italian and international pieces, which would then be launched classically, but also like in an opera, both with improvisations by the orchestra as with divergent voices, and with rhythms as in pop music. The four young sopranos studied the conservatory and in 2008 they performed for the first time with Andrea Bocelli in Rome. They guided him in a set of opera arias and Neapolitan chants. Since then they were on stage with him on regular basis during his tours. The DIV4S performed mostly in Italy, until now. Through singing during the Night of the Proms concerts in 2011 (and in 2010 Charleroi) they would like to expand an international career like Bocelli did after his participation to the NOTP in 1995. By the way, it is Carlo Bernini, a known Italian pianist and Bocelli’s artistic leader who advices the DIV4S artistically. Bernard: Thanks for receiving us during this Night of the Proms concert in Antwerp. You are from Italy, have you been well received by the organization? DIV4S: Absolutely! And Flor (organization NOTP) is a very reliable and delicious man. Do you eat well in Belgium, and not only with Antonio Etneo ? We all have a curious nature and we appreciate your kitchen, even when it’s different from ours. But it has to be light with a lot of flavour and very healthy. And if the food has been prepared with love, then you always eat very, very well. We fitness a little, that’s never a bad thing to do… We rehearse on daily basis and like talking a walk in Antwerp, an extremely pleasant city by the way. We also sleep a lot; that’s important to our voice. The most important is to remain focused on what we’re coming to do here. We have enjoyed your performance. What are your own feelings towards it? Singing is kind of special in this type of show. We don’t only have to respond perfectly to each other, but also to the orchestra. On the other hand, we have to say that it ran smoothly from the beginning. We are very satisfied with our performance this evening because we’re starting to relax and can benefit of this wonderful audience and that grand stage. During the previous evenings we were more tensed. To keep the focus is essential. Every evening is different, although the repertoire is identical. The more we succeed to relax, the easier everything goes. What can be improved about your performance? Everything! Always. We have to keep improving, perfecting, learning more and more. Are all settings by Carlo Bernini’s hand? Has he already seen the concert and is he satisfied? 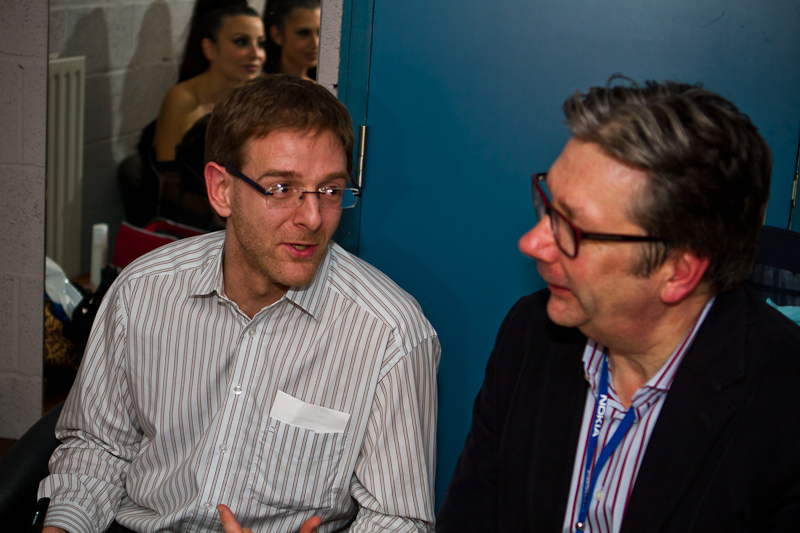 The different pieces for NOTP were chosen together with Jan Vereecke (NOTP organization leader). They are on our album, which has been published especially for NOTP. It’ll only be published at the end of November in Italy, before the festivities. Carlo is our ‘Maestro’ and the group’s coproducer. He has been following us strongly during the preparation of the classical part. The title of your album is ‘Opera’. On it are several pieces you sing during the NOTP concerts. Are there also more modern songs, like the one you sang during the showcase in the ‘Stadsfeestzaal’ in Antwerp? (Woman in love, Canto Bella Terra, Self Control)? On the album there are even more crossover pieces, real challenges. In our career we’re always looking for high quality music! And we’ll see where that road leads us. Both in classical as in modern music we find interesting songs, challenges we can shape in a special way with our voice. Is Night of the Proms like Bocelli described it to you? Yes, absolutely. He recently told us quite emotionally about the time he spent here. Back then, he only was famous in Italy. But to him, international speaking, everything started here. What do you think of this Proms edition? Are you in contact with the other artists? Have you, for example, got lunch together? No. We’re already very satisfied to be able to share the stage with Seal. Are you happy with audience reactions? But you can only hear the orchestra through your earphones. Do you still hear the audience? Definitely! Sometimes more than other times. At the first concerts we were kind of withdrawn, but we now hear the audience very well, and we’re able to see them as well! Both the audience and the press agree with your great vocal qualities, but they think you’re little spontaneous, too formal on stage. Is it because of your singing fashion that you can’t move? Actually we perform in two different ways. Our classical model requires a more elegant, but static performance fashion. We pose ourselves like that to perform the music in the best way. During the pop part, more crossover, we try to communicate more dynamics and emotion. We like it! Your singing and presence on stage are indeed more spontaneous with Seal’s Kiss from a rose. And with ‘Con te partiro’ as well! That defile in the audience is a beautiful meeting. Are you still nervous before a concert or before you join the stage? Let’s say that we’re rather ‘emotional’ than nervous. Are there common projects with other artists? We think that the cooperation with Seal is already a big victory. This is something very exceptional to us. Are there other projects in this nature? We try to control the current situation and get used to this kind of show. It would be wonderful to be able to cooperate with other people. But always when we deal with music or a music piece, we’re always with a little too many, with our four voices, four women, four sopranos. So we always need to study the situation, and we need some time to handle it. We’re here because of Andrea Bocelli’s advices, and we keep to his good advice both purely musical as in our image. We’d like to keep to a certain style, a certain elegance and a certain severity. We move on with small paces, one behind the other, to avoid slipping on a banana peel. Well, another bravo for your performance and we wish you every bit of success in the future! NOTPfan.eu and the German website notp-fanpage.de are DIV4S biggest fans. Therefore we showed them the little banner we try to unroll every time we attend a concert (if security people let us…). The DIV4S laugh themselves silly and we hear pleasant cries; the four sopranos gladly accept to pose with us and the banner. A great thank you to Patrick who wanted to be our translator Italian / French.